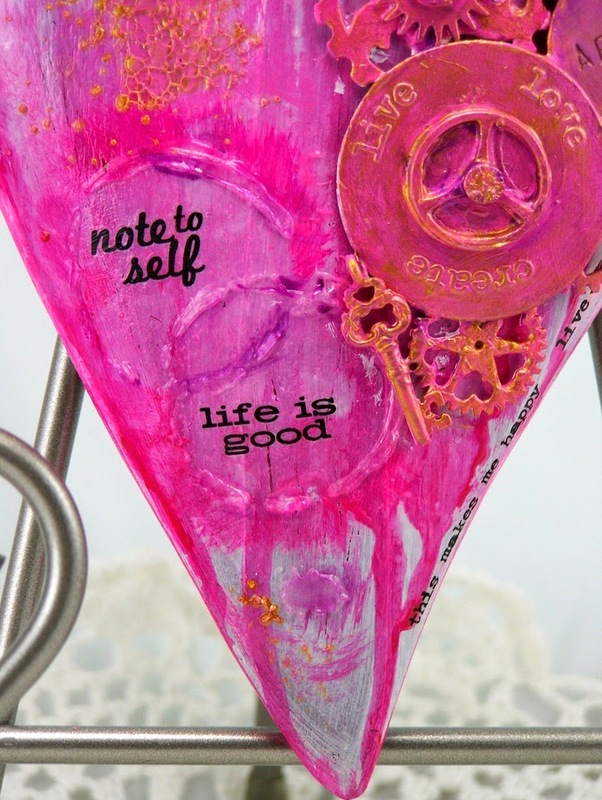 Eclectic Paperie: Note to self~Life is Good! I call it ~ note to self-life is good! 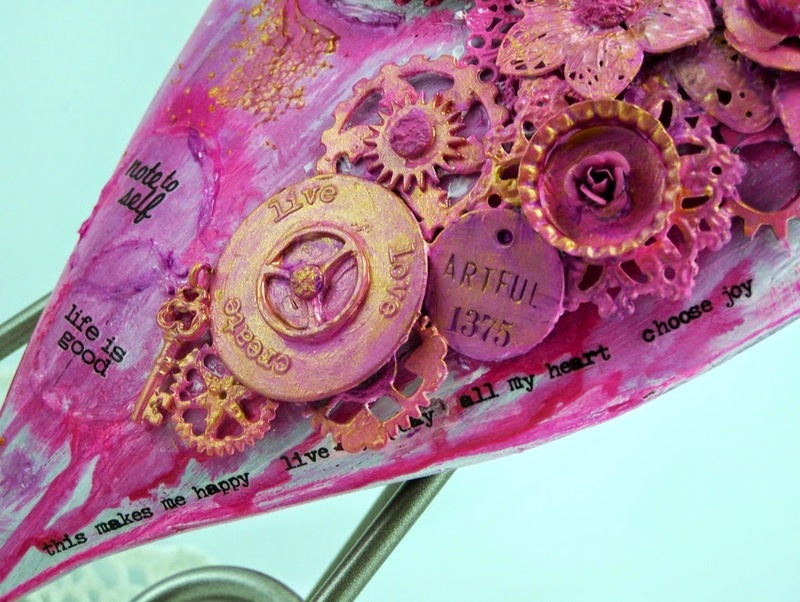 All of the words are Tim Holtz Remnant rub-ons called Life Quotes. The circles were made using Wendy Vecchi's Studio 490 Translucent Embossing Paste and the TCW Coffee Splotch stencil. I thought the joined circles grounded the two sentiment rub ons. 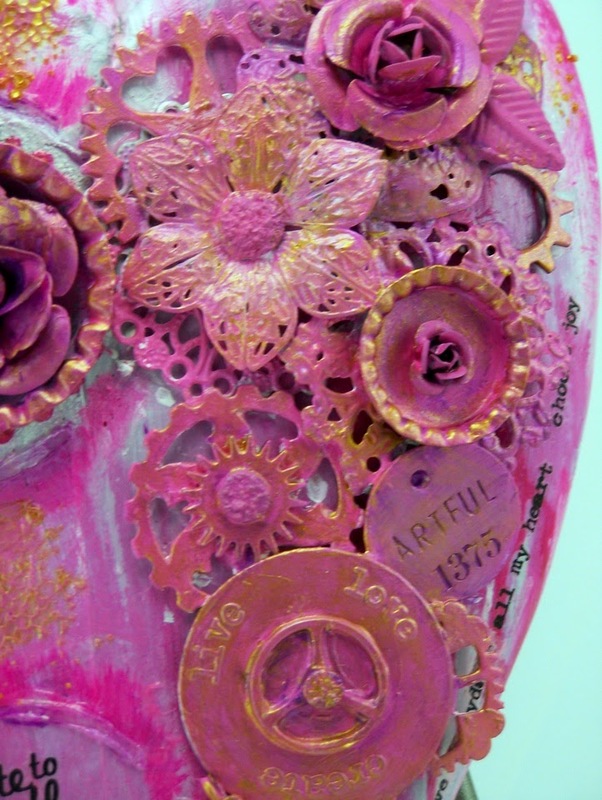 All of the metal doo-dads and buttons and gears are trinkets I keep in a drawer and mix and match when I collage. Some are Prima, some are Idea-ology, and others are just stuff. In this photo, you can also see the dots I made inside the circle with Art Anthology Dimensional Crystal in peony. I painted the metal parts after they were all glued on and dry with white gesso for a base so the paint would adhere. 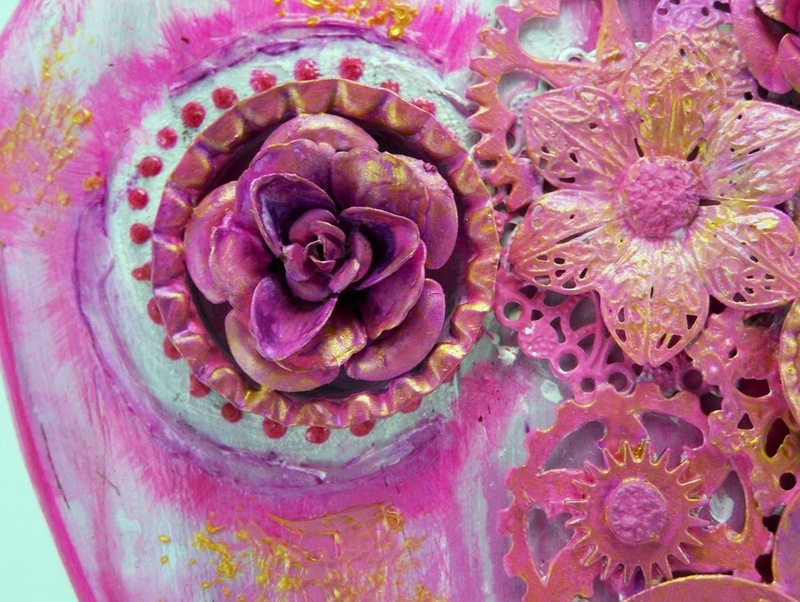 Then I alternated layers of TH Distress paints in shades of pinks, and Silk Acryllic Glaze in Rasperry Wine and Gold. On the left you can see the gold embossing paste I added with the TCW Mini Texturized 6x6 stencil. I felt I needed some gold on the left, middel and bottom of the heart to balance out the gold Silk paint on the collage down the right. "note to self- life is good" to really stand out. Here is what the heart looked like when I purchased it. But I couldn't leave well enough alone! 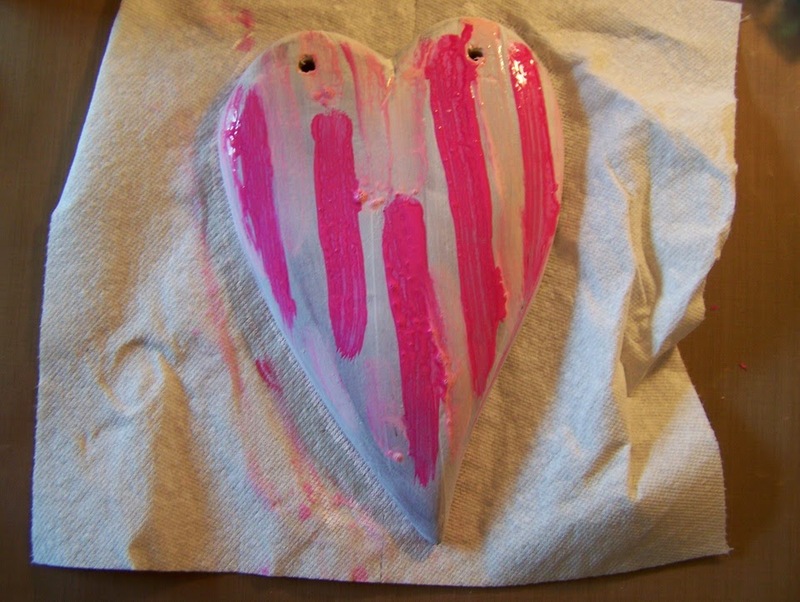 I covered it with white gesso and added streaks of TH Distress Paint in pink shades. 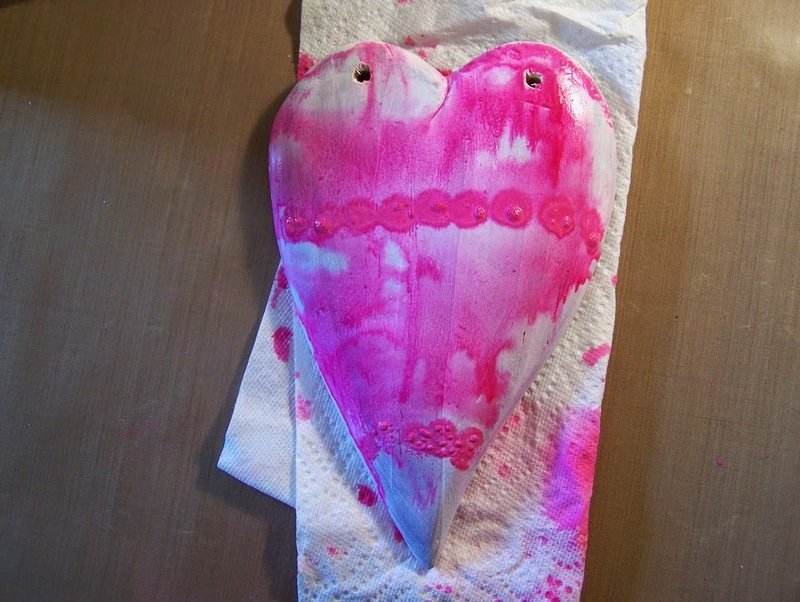 I spritzed it with water and let it streak down the heart. I kept adding more and spritzing with water until it looked how I wanted it to. 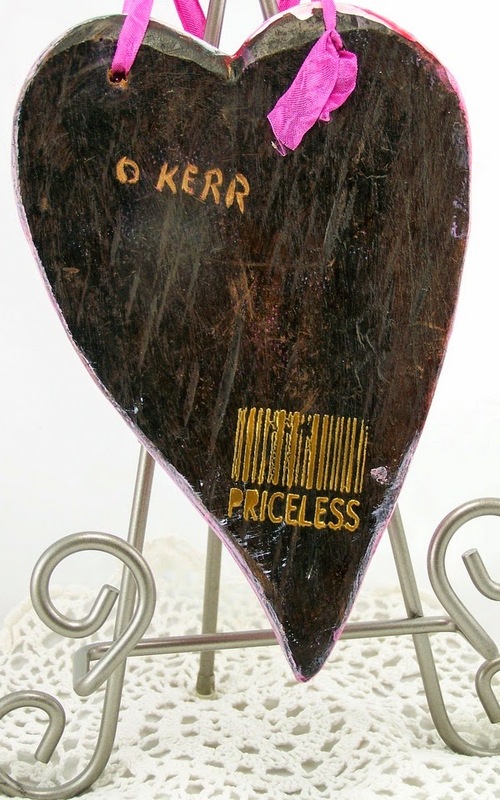 On the back, the artist who carved and painted the heart, carved his name in it. I added the gold barcaode with WV gold embossing paste and the WV barcode stencil. LOVE! Here it is, hanging on my art wall in my craft room. Sorry there are no more process photos. Once I started collaging and painting, I forgot all about photos! YIKES! Hope you like my art from the Heart! 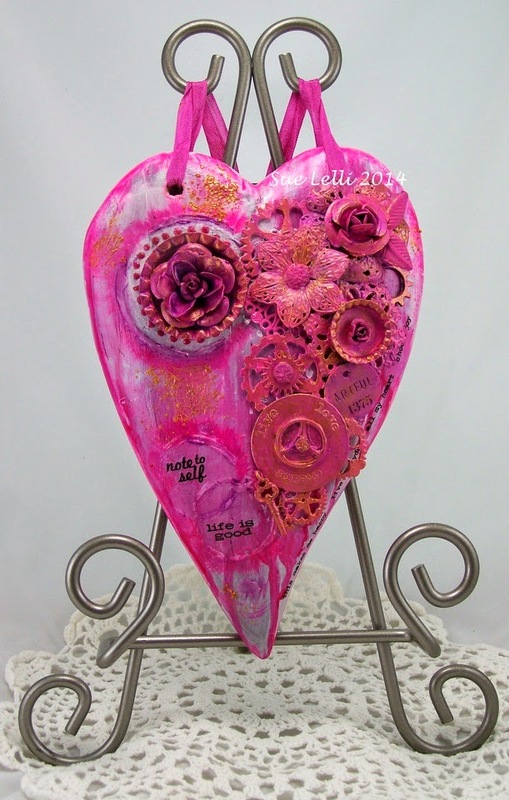 what a great redo of a plain red heart Sue - so colorful and fun with all of the pieces you added! and it fits right in on your wonderful art wall! You'll also remember that vacation every time you see it there! 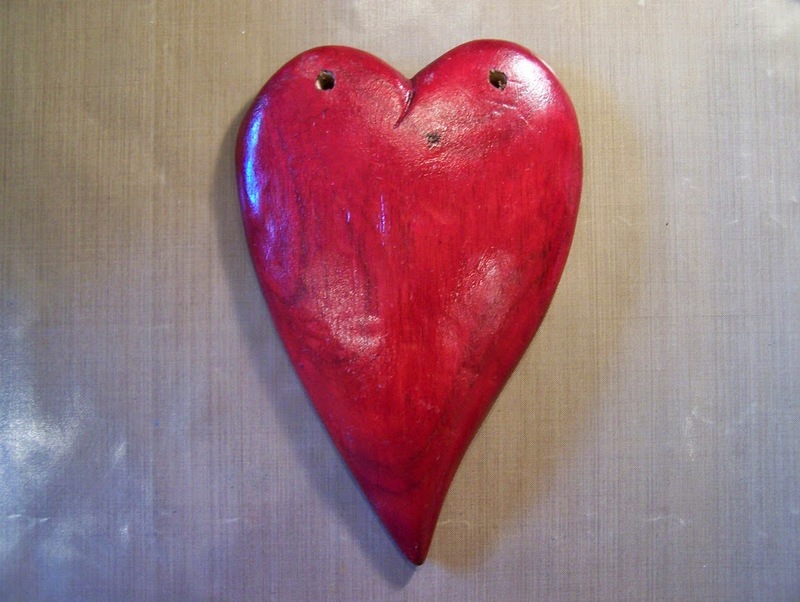 Awesome way to alter and personalize that wooden heart! I LOVE all the 'bits'!!!!! 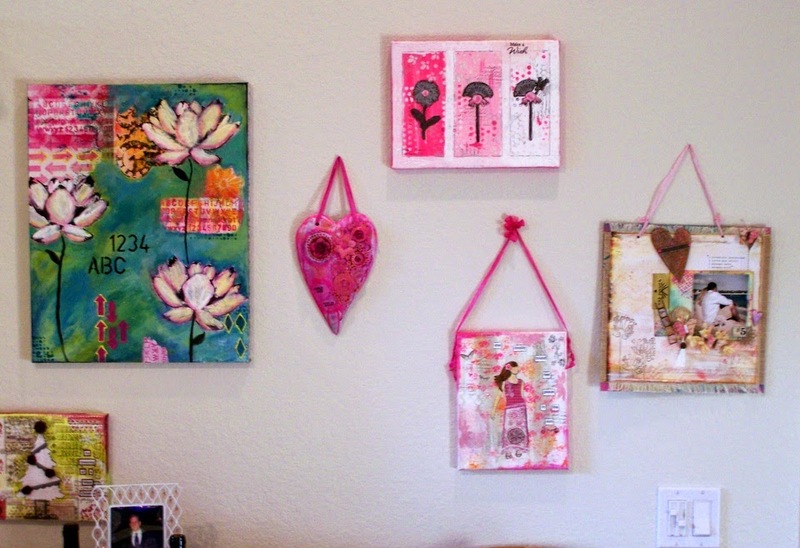 And LOVE LOVE LOVE how it looks on your wall with the other wonderful projects. LOVE it. Sue the heart you transformed turned out so fabolous. I LOVE all the details and the vibrant colors. 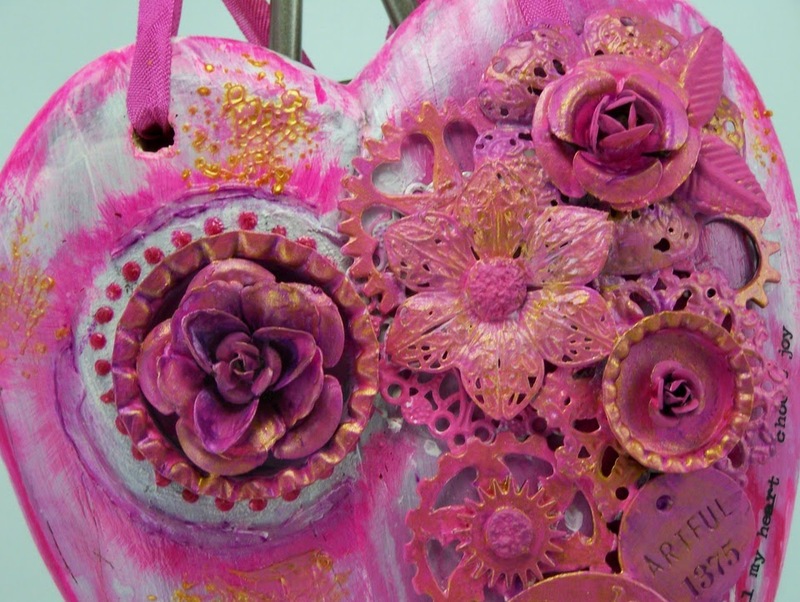 You achieved a very good balance of the different types of embellishment, flowers, metal trinkets, rub ons etc..
By the way I also adore the art piece you hanged on the left side of your new heart. The one with Lotus (?? ) flowers. Wow thats amazing too. Is it one you made yourself ?? Oh gosh... You are so creative !! Thanks a lot for sharing.